French fashion brand Lacoste demands the removal of Bethlehem artist Larissa Sansour from major photographic prize. The prestigious €25,000 Lacoste Elysée Prize is awarded yearly by the Swiss Musée de l’Elysée with sponsorship from Lacoste. Larissa Sansour was among the eight artists shortlisted for the 2011 prize. In December 2011, Lacoste demanded that her nomination be revoked. Lacoste stated their refusal to support Sansour’s work, labeling it ‘too pro-Palestinian’. A special jury will convene in January 2012 to select the winner. As a nominee, Sansour was awarded a bursary of €4,000 and given carte blanche to produce a portfolio of images for the final judging. In November 2011, three photos for Sansour’s Nation Estate project were accepted, and she was congratulated by the prize administrators on her work and professionalism. Sansour’s name was included on all the literature relating to the prize and on the website as an official nominee. Her name has since been removed, just as her project has been withdrawn from an upcoming issue of contemporary art magazine ArtReview introducing the nominated artists. In an attempt to mask the reasons for her dismissal, Sansour was asked to approve a statement saying that she withdrew from her nomination ‘in order to pursue other opportunities’. Sansour has refused. 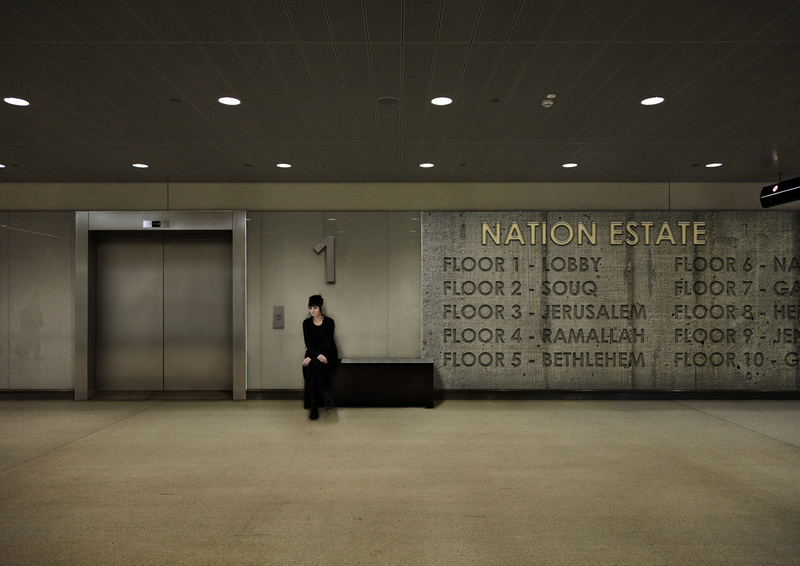 Sansour’s shortlisted work, Nation Estate, is conceived in the wake of the Palestinian bid for UN membership. 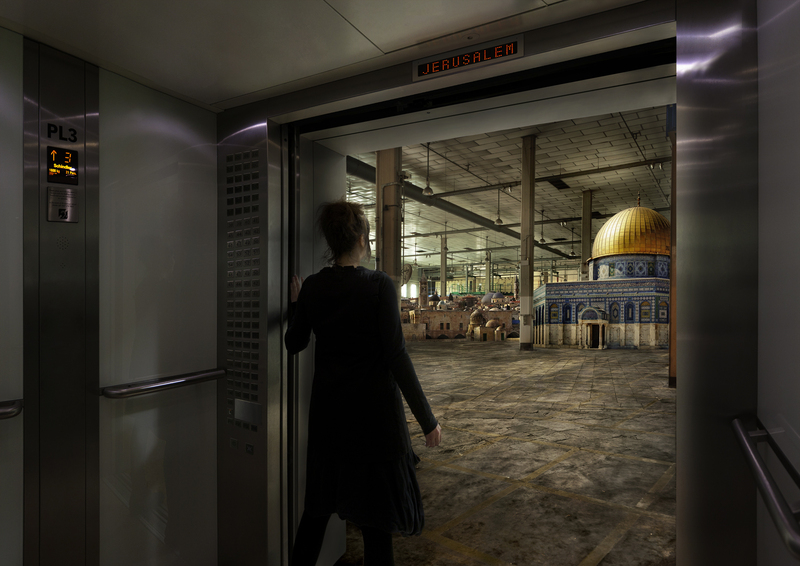 Nation Estate depicts a science fiction-style Palestinian state in the form of a single skyscraper housing the entire Palestinian population. 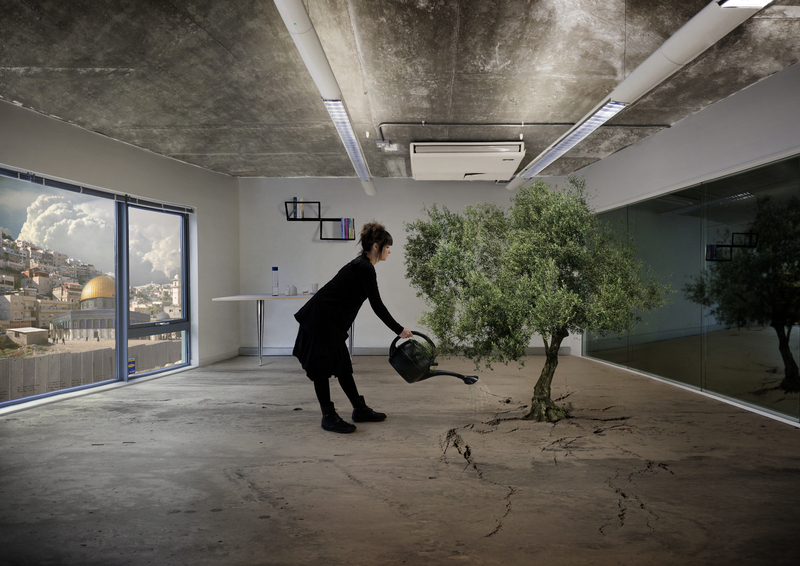 Inside this new Nation Estate, the residents have recreated their lost cities on separate floors: Jerusalem on 3, Ramallah on 4, Sansour’s own hometown of Bethlehem on 5, etc. Regretting Lacoste’s decision to censor Sansour’s work, Musée de l’Elysée has offered to exhibit the Nation Estate project outside of the confines of the Lacoste sponsorship. Musée de l’Elysée is based in Lausanne, Switzerland. The Lacoste Elysée Prize 2011 is the award’s second edition. Søren Lind, Sansour’s assistant, declared Tuesday(20th Decemeber) that Lacoste had yet to give any public response on the matter. Spokespersons for the Musée de l’Elysée were contacted, but no statement was forthcoming. Palestine Solidarity Campaign has also denounced the decision by the Lacoste Elysée Prize to exclude Larissa Sansour from the final shortlist on grounds that her work is too ‘pro-Palestinian’ in a public statement. Wednesday 21st December, after the news spread to many international newspapers Lacoste reacted by cancelling their sponsorship of the entire Lacoste Elysée Prize 2011. You can read their statement here and the statement by Sam Stourdzé, Director of the Musée de l’Elysée here. As an Israely pro Peace and human degnity. I want to share with you a point of view that’s looking at what I see here. I live in Israel now,I lived in USA for many years and I thought that there would be no way to live in harmony with Arabs. Now that I live in Israel I realize we alredy live Israelies and arab israely in harmony and respect.Just yesterday I visited an Arab vilage, Far Adis, yes we walked around, we shopped just like any place you or I will visit. Yes there are things that are not conveniant to say beacouse some people want to make sure to be right and act with a victim consciousness! We Israelis for centuries dream of peace and only if each one of us Human being will take responsibilty and not lie to ourselves we can achieve! Love and peace will live forever!hate will disappear forever!